In this part we will explore the meaning of the 49th Shloka of Sri Vishnu Sahasranamam. Bhagavan makes good of his vows to protect anyone who surrenders unto Him. He has a beautiful, enchanting, mesmerising, handsome, charming, pleasing face blooming large eyes resembling the lotus-petal. He is subtle and difficult to comprehend who can only be realised through constant contemplation and deep meditation. He has a sweet and mellifluous voice symbolising the Vedas. He also has a very powerful and mighty voice like that of a thunder. He confers happiness on righteous ones and deprives the evil and wicked of their joy. He helps people without expecting anything in return. He captivates everyone’s mind and heart because of his unlimited Bliss. He has conquered anger and gets angry only if and when He chooses to get angry of His own will. He has mighty arms that destroys the evil-doers and to protect Dharma. He destroys those who act against Dharma. One who observes Nitya-karmas in His incarnations to set an example for us. Sri Adi Sankara explains this as ‘Shobhanam vratam asya iti Suvratah – He has a noble and Supreme resolve to protect anyone who approaches him’. Meaning: He who seeks refuge in me just once, telling me that ‘I am yours’, I shall give him assurance of safety against all types of beings. This is my solemn pledge. Meaning: Abandon all ideas of righteousness and just surrender unto Me. I will relieve you of all your sins and liberate you from grief. Do not despair. Meaning: To all those who surrender unto Him, He gives protection here and Vaikuntham (Moksha) upon death. Sri Radhakrishna Sastri observes that Bhagavan had good control of His habits when He was Nara-Narayana. Swami ChinmayAnanda gives another dimension of the Nara-Narayana incarnation as it applies to the Nama Su-Vrata – He who did intense tapas (Su-Vrata) for a number of years in the Nara-Narayana mount in Badrinath. Sri Parasara Bhattar gives another aspect of Bhagavan’s Guna i.e. Su-Vrata to mean good deeds. Bhagavan has nothing to gain by observance of any Karma such as the prescribed Kula Dharmas. Even so, Bhagavan observes all the Anushtaanas or rituals during His Avatars without exception. Thus He is Su-Vratah. Meaning: O’ Arjuna! In the spiritual worlds, in the heavenly worlds and the material worlds, there is no prescribed duty for Me; neither anything to be obtained or given up, Yet I am engaged in appropriate activities. Bhagavan continues to work purely for the benefit of His Creation. This is the significance of His Nama as Su-Vrata. He says in the very next Verse in the Bhagavad Gita that if He did not do this, He will set a bad example for others, and they will not perform their prescribed duties and suffer for this lapse. The Dharma Chakram writer gives some examples of the power of Su-Vrata. Bhishma practised the Su-Vrata of Brahmacharya, which gave him his enormous greatness. Harishchandra’s story is a great example of Satya-Vrata. Sri Adi Sankara’s commentary on this is ‘Su Shobhanam Mukham asya iti Sumukhah – He has a beautiful face, hence He is called Sumukhah. 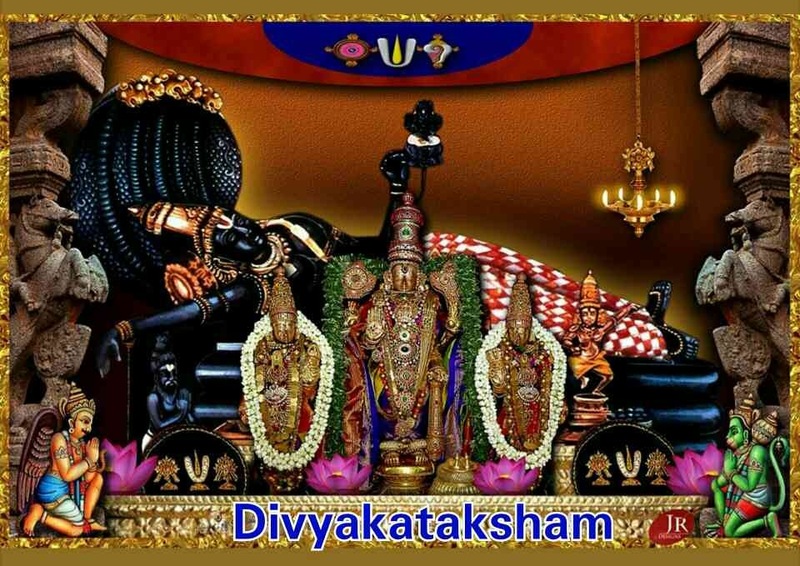 He gives the passage from Vishnu Puranam (6.7.79) which is ‘Prasannavadanam Chaaru Padmapatraayatekshanam – His face is pleasing, handsome, possessed of large eyes resembling the lotus-petal’. Meaning: After roaming in the great forest for fourteen years, I shall come back and very gladly stand by your command. Meaning: Rama, having decided to leave the Kingdom and head to the forest, did not have any sadness and proceeded with a serene mind of an ascetic beyond worldly pain and pleasure. Sri Adi Sankara gives a third explanation ‘Sarva vidyopadeshena Va Sumukhah – He was delighted at having successfully imparted all the Vedas to Brahma’. A true Guru derives a lot of happiness if he finds the perfect student and is able to impart all his knowledge. In Brahma, he found a true student and imparted the full knowledge of the Vedas to him. Hence he became ‘Sumukhah’. Svetasvatara Upanishad (6.18) says ‘Yo Bramhaanam vidadhaati poorvam yo vai vedaamshcha Prahinoti tasmai – He first created and then taught him all the Vedas’. This can be taken as a reference to His having a sweet countenance even when He was chanting the mantras and meditating as Narayana Maharishi in His Nara-Narayana Avatar. Sri Parasara Bhattar also refers us to the mantra ‘Krishna – Krishnaaya Kamaladala Amala Netraaya – To Sri Krishna, who has a face with eyes that are pure and spotless like a Lotus petal. Meaning: The dark-hued Lord is the One who came as a cowherd lad and stole butter. He is the Lord of Gods and of Arangam also. He has stolen my heart. After seeing my Lord and experiencing ambrosial delight, my eyes will see nothing else. Sri Radhakrishna Sastri explains the significance of this Nama by pointing out that with practice one overcomes the strain of severe penance, and hence the countenance will not reflect any strain. But in Bhagavan’s case we see cheerfulness rather than mere lack of strain. When He was told to go to the forest just at the time He was decorated for Coronation or Pattabhishekam, His face didn’t show the slightest indication of disappointment or sadness. Instead Rama displayed a calm and serene face typical of the greatest of Ascetics who have renounced worldly things. Kamban’s description of Rama’s face is “Meit-tiruppadam mevu endra podilum, it-tirut-turandu egu endra podilum, cittirattil alarnda Sen-taamaraiyai ottirukkum mugattinai unnuvaaL” – Lord Rama’s face resembled a picture-perfect Lotus-flower no matter whether He was asked to ascend the throne or to renounce it all and go to the forest. As Sri Adi Sankara interprets it as ‘Shabdaadi Sthoola kaarana rahitatvaat – Sahabdaadayah hyaakaashaadeenaam uttarottara sthoolatva kaaranaani Tadabhaavaat – Sookshmah’. He is free from gross physical causes such as sound. Sound arises from the physical causes for the gross body like Akaasha and others while Bhagavan is too subtle to be attributed to any external physical Cause. Mundaka Upanishad (1.1.6) says ‘Sarvagatam Susookshmam – He is very subtle and all pervasive in the most delicate way’. He is Sukshmah because He can be realised only by contemplation and deep meditation that is performed without expectations of any benefit. He can’t be comprehended through physical organs such as eyes or ears, nor can He be realised through the mind, but He can only be experienced. Sri Radhakrishna Sastri explains the power behind the concept of Sukshma. The subtler the object, the more power it has. We all know the ultimate power of the atom. If we start from the macro level of our body, and go through the different subtler levels such as the sense-organs, the mind, the intellect, and finally the Soul, the power increases as the subtlety increases. MahaVishnu is subtler than the subtlest of things, hence He is Sukshmah. Swami ChinmayAnanda points out that in Vedanta terminology, Sukshma or subtlety implies pervasiveness, and Bhagavan’s Nama of Sukshmah refers to His All-pervasiveness. Sri Satyadevo Vasishtha gives a different perspective to this Nama by tracing the Nama to its root word ‘Suc – paishunye’ meaning ‘to point out or to indicate by gesture’. He gives the explanation that Bhagavan is Sukshmah because, even though He does not manifest Himself expressly, He expresses Himself through everything around us all the time. This is the Sukshma behind Vishnu the Sukshmah, viz. that He is all around us and has never really hidden Himself from us in any way. Just as the sound made by the cow identifies the cow even if the cow is not seen, or the voice of a person identifies the person even though the person is not seen, so also everything around us that is created by Bhagavan identifies Him to us. He has a very sweet, deep and sonorous voice. We have covered this in Nama 41 as ‘Mahaasvanah’ which has a similar meaning. Sri Adi Sankara gives two interpretations for this Nama ‘Su Shobhano ghosho Vedaatmako asya iti, Meghaghambheera ghoshatvaat vaa Sughoshah- He has a sweet and mellifluous voice symbolising the Vedas or He has a very powerful and mighty voice like that of a thunder’. Sri Parasara Bhattar’s interpretation is that Bhagavan is Sughoshah because He is proclaimed by the Vedic voice of the Upanishads. Bhagavan is Veda-svarupi Himself. Naranan Muvezhulagukkum Nathan, Vedamayan – ‘Narayana’ is the master of all the worlds, extolled by the Vedas, He is the cause, effect and the act of all. The Dharma Chakram writer points out that when Veda is chanted with the proper intonations, the sound originates from the region of the diaphragm, and this sound has the ability to cleanse and purify our body and mind just like the sweet sounds of Nature, the rustling trees and chirping of the birds, is soothing and comforting to the mind. The two sentences have to be connected. Bharathiyaar composed these beautiful lines in his song “Kaakkai chiraginile Nanda lala…..Ketkum oliyil ellaam Nanda lala, Undan Geetham isaikkudhada Nanda lala”. All the musical instruments were discovered as a result of listening to the sweet sound of Nature. This Nama should remind us that all the mantras chanted and songs recited in the praise of Bhagavan glorifying his virtues are Sughoshas. Sri Satyadevo Vasishtha looks at the Nama from its root – ‘hushir vishabdane – to proclaim, to declare’. The Nama Su-ghoshah is formed by prefixing the upasarga su- which means “Sobhana”. Su-ghoshah is thus the sound which proclaims Him well repeatedly or loudly viz. the Vedas. Since the Nama and the One who is referred to by that Nama are same, He becomes Su-ghoshah. Bhagavan manifests Himself through Sughoshah in real life constantly everywhere. The knowledge of the rain, that of the running water as well as water that is obstructed from its natural flow, all these can be known from the sound emanating from these. Just as a great artist is revealed by the art he/she creates, Bhagavan is constantly revealed through the sweet sounds of Nature that He has Created. Sri Adi Sankara interprets this as ‘Sadvrittaanaam Sukham dadaati asadvrittaanaam sukham dyati khandayati iti Sukhadah – He confers happiness on righteous ones and deprives the evil and wicked of their joy, so He is called Sukhadah on both these counts’. Thus both Sadhoonaam Paritraanam and Dushkritaam Vinaashanam are summarised in this Nama. Sri Parasara Bhattar’s interpretation is – ‘Sadaacaara Samaadhi anushthaapanena tan-nishthebhyah phalam parama-sukham dadaati iti Sukha-dah – Bhagavan bestows Supreme Bliss on those who practice Sadaachara (good conduct) and deep meditation (Samadhi)’. Meaning: For, if I did not engage in work, O’ Partha, certainly all men would follow My path and stop performing their duties. Sri Ramanujan refers to NammAzhwar’s Thiruvai Mozhi 7.10.1 – “inbam payakka inidudan veetrirundu iv-ezhulagai Algindra engal piraan – He is our Lord who rules us sweetly, spreading happiness over the seven worlds”. The Dharma Chakram writer points out that even though Bhagavan is the One who bestows even the ordinary benefits such as wealth, health etc., based on karmas, the significance of the current Nama is that He alone can bestow the Ultimate Sukham or bliss i.e., Moksham. Sri Satyadevo Vasishtha analyzes the word into three part su, kha, and da, and gives an interpretation different from the above. He starts with khanu – avadhaarane – to dig, and equates su-kha with the Sarira (body) with its outlets that allow us to lead a life without sickness, disease etc. One who gives this Sukha Sarira is Su-kha-dah – Sukham khaatam tad-dah Sukhadah Vishnuh. Sri Adi Sankara explains this as ‘Pratyupakaara Nirapekshatayaa Upakaaritvaat Suhrit – He helps people without expecting anything in return hence He is called as Suhrit or a friend/well-wisher. Ordinary people help each other only in the expectation to get some favours in return. But Bhagavan renders help and support to everybody without expecting anything material in return. Sri V.V. Ramanujan refers to Srimad Ramayanam – ‘Ripunamapi vatsalah – A friendly disposition even to His enemies’. Rama gave Ravana many reprieves by saying ‘Indru poi Naalai va’ (Go back home and return tomorrow), thus giving many opportunities to Ravana to reform and surrender to Him. The Dharma Chakram writer observes that the heart which suffers when struck by sorrow and rejoices at favourable event, is not considered as “good heart” in this context. A heart that bleeds when others suffer is referred as ‘good heart’ in this context emphasising compassion or Karunya bhava. A pure heart is one which anguishes when someone else suffers, and rushes to help those in need of help. Meditating on the significance of this Nama will lead to the purification of the heart of the devotee. Guhan was the Chieftain/ruler of the Nishada tribe who were boatmen and hunters. 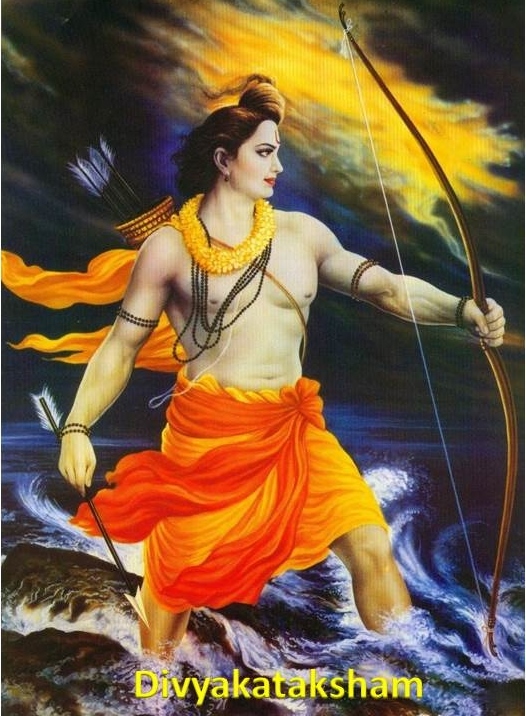 Rama had begun His exile and reached the forest near the banks of River Ganga. He was received by the sages in the forest. 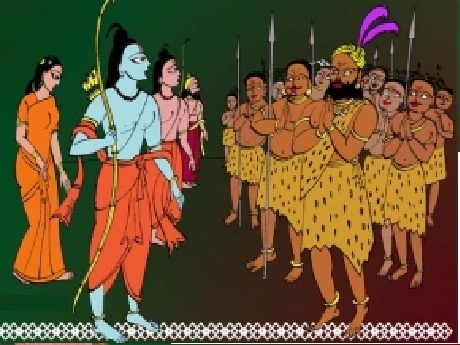 When Guhan heard that Sri Rama was in his vicinity, he was overjoyed and wanted to see him. He left with his friends and relatives to the hermitage of the sages where Lord Rama was staying. Guhan melted at the sight of Rama. 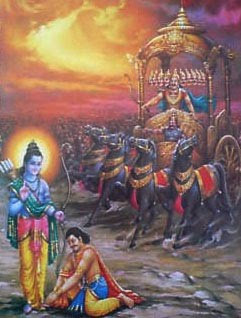 He fell at Rama’s feet. Stood before him, his body bowed humbly and his fingers were covering his mouth in reverence. 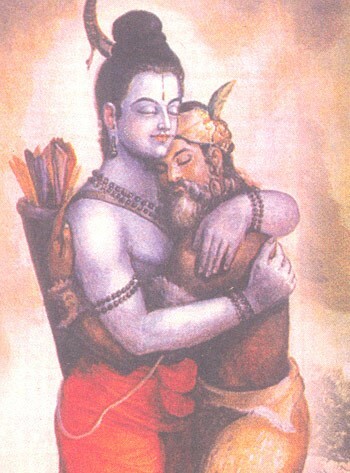 Sri Rama, perceiving Guhan’s hesitation, hugged him to his bosom and introduced him to Lakshmana. “Do you remember him, Lakshmana? He is my dearest friend Guhan, the King of Sarayu”. ‘Be seated here,’ said Rama, offering a seat nearby. But Guhan did not sit. Boundless joy, love and devotion were welling up in him. ‘Thenum meenum amudhinukku amaivadhaagath thiruththinen konarndhen endraann’ meaning I have brought honey and finest of fish for you to eat. As a simple boatman and a hunter, he felt that, what was good for him must be good for the Lord as well. He was not even aware that the sages did not eat fish and that taking it inside the abode of a hermit is abominable. Rama turned to Guhan and said ‘I need to cross the Ganges, you go back to your town with all your kith and kin and bring us a boat in the morning for us to cross the river. Guhan was grieved over the fact that Rama whom he had seen earlier as a prince decked with jewels and with rich silk attire had come there now as a hermit not aware of the fact that Rama was on exile then. Rama realised that, here was a person whose love knew no bounds. 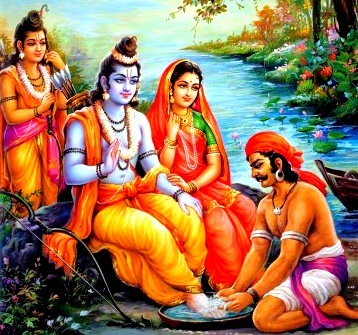 That night Lord Rama and Sita were for the first time having their rest in the jungle. Rama slept on a bed of straw while Lakshmana stood guard, remaining wakeful throughout the night. Guhan stood by his side. His bow was bent and drawn. His mind was boiling with anger and was full of sorrow too at the thought of Lord Rama sleeping on a bed of straw. ‘I will stand guard here. You may have your rest, offered Guhan to Lakshmana. ‘I cannot sleep when my brother is lying on the grass,’ said Lakshmana. “Being protected by you who keep your duty alone in view, O’ sinless Guhan, we all are not the least afraid of any in this land. But so long as Sri Rama, son of Dasaratha remains lying down on the ground with Sita, how can I sleep. Guhan’s mind was working on something else. 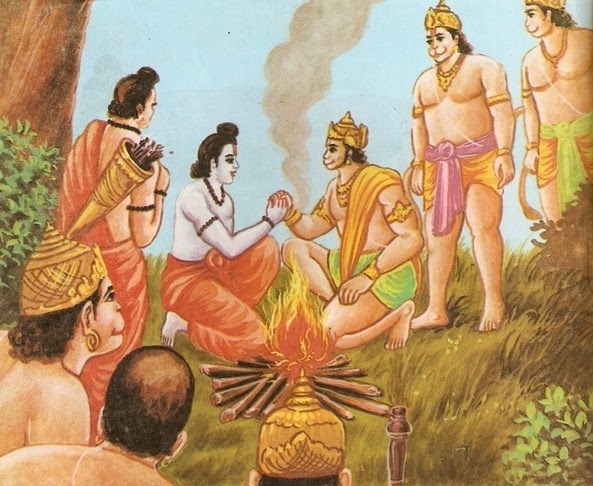 Rama was asked to live in the forest. He wanted his Lord to stay with him. That would not be in violation of what was imposed on Rama. He would still be in the forest, under his care, though. Guhan addressed Lord Rama in the morning. ‘We are 50,000 strong people.’ These hunters are at your service and would wait upon you for your orders. They are stronger than the celestials. We would consider ourselves fortunate and blessed if you stay with us. Rama heard his request, and his mind was filled with compassion. He smiled. My dear brave man! I have a few things to do. I have to take a holy dip in the sacred rivers in different places and I have to meet sages to seek their blessings. I will come back to you after a few days. Guhan helped Lord Rama, Sita Devi and Lakshmana to cross the river Ganga and from there they went to Sage Bharadwaja’s Ashram. The Azhwar refers to Guhan as ‘Yezhai- Ethalan- Keezhmagan’ to mean ‘poor boatman of lowly birth’. 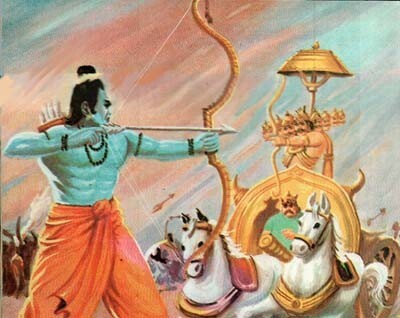 The emphasis on Guhan being illiterate, immersed in sensual pursuits who kills for food (being a hunter), born in low caste is to highlight the equipoise and even-handedness of Lord Rama who received him with respect and dignity like he would show any other Royal. The Azhwar goes on to sing, Despite Guhan being an illiterate boatman, you still did not look down on him; You showered Your grace on him; and also said to him, further, This darting, deer eyed Seetha is your friend; this younger brother is your brother too. Not just that, He added to say that You are my friend; the fifth brother (in our family). Kamban says “Guhan-odum ivar-anom – With Guhan we have become five brothers! 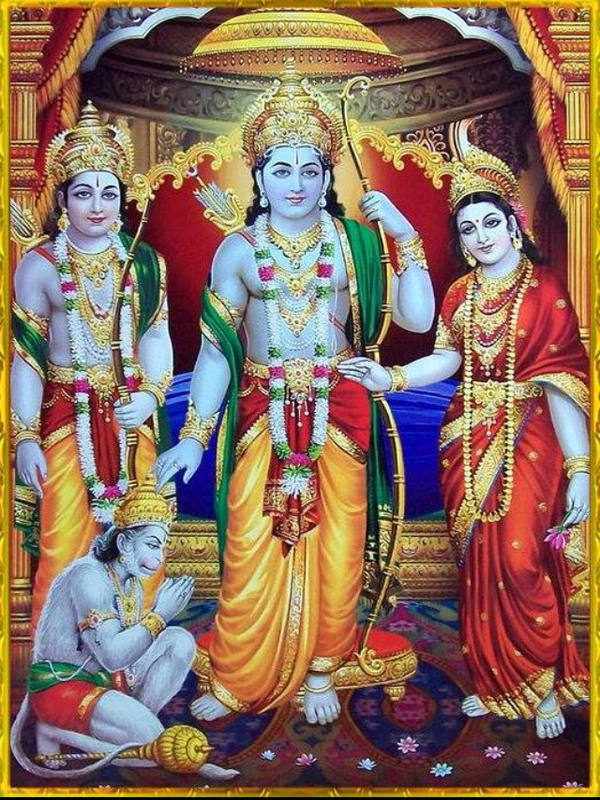 Lord Rama showed his compassion and friendship as his response to Guhan’s love and devotion! Azhwar expresses his devotion in the Pasuram by saying those words of Rama come to haunt my heart O’ Ocean-hued Lord, I’ve come to your lotus feet, O’ Lord who is surrounded by groves in Arangam (Sri Rangam)! Sri Adi Sankara interprets this as ‘Niratishaya Aanandaroopatvaat Mano Harati iti Manoharah – He captivates the mind because of his unlimited Bliss, hence He is called Manoharah’. 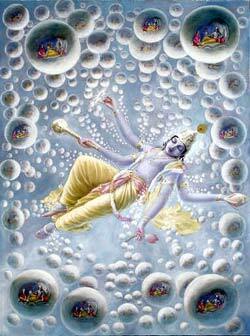 Chandogya Upanishad (7.23) says ‘Yo vai Bhooma tat Sukham naalpe Sukhamasti – The Infinite Itself is joy. There is no joy in the finite. The Infinite alone is joy’. Because of the innate benevolence noted above, He captivates everyone’s heart and mind. 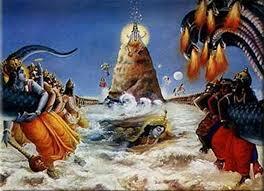 Bhagavan in his Mohini Avatar attracted the attention of all the Asuras. Sri V.V. Ramanujan gives reference from NammAzhwar’s Pasuram – ‘Maiyal Seidu ennai manam kavarndaane – He captivated my mind and took my heart’. Thiruvai Mozhi 7.2.6. Swami ChinmayAnanda has appropriately translated this Nama as “One who loots the mind”. 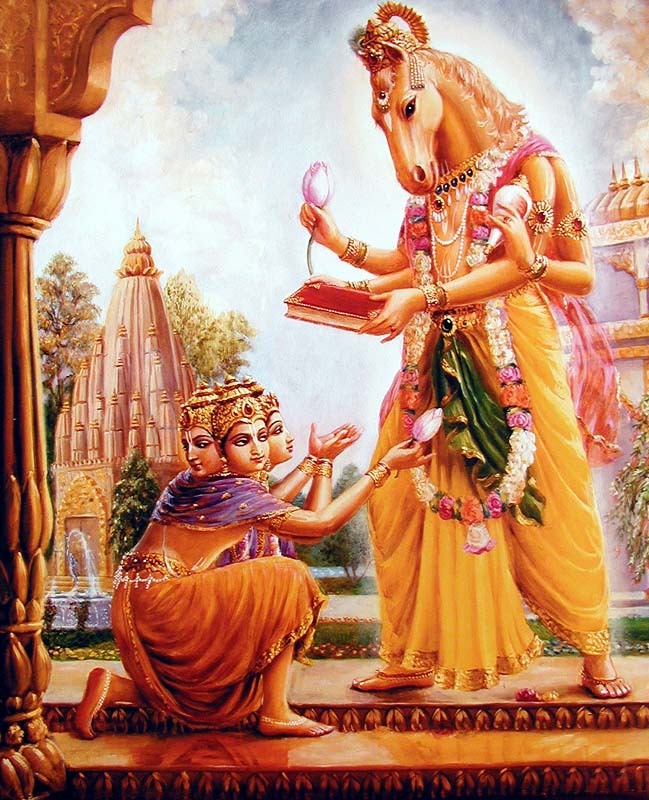 His interpretation is “Not only is the Lord Beauty Incarnate, but He sways the attention of his devotees away from all other sense objects and persuades them to dwell upon His enchanting form. Thus Lord Vishnu generates an irresistible joy in the mind of His devotees and enthuses them to spend their time constantly contemplating on Him”. Sri Satyadevo Vasishtha points out that Bhagavan has created all things with this Mano-haratva attribute built into everything He Created. Now we see all these beautiful things around us, and our mind is captivated by this ingenuity of the Creator, and we wonder aloud – “Who could it be that Created this marvel?” So He is Manoharah. The Dharma Chakram writer generalises the interpretation of this Nama to suggest that Bhagavan gravitates the minds of people either towards Him or towards the worldly objects depending on what they want. Those who want materialistic pleasures, He gravitates their mind deeper towards the life of short-term enjoyment; and those who have controlled their mind and senses, He gravitates these devotees closer and closer towards Him. So Bhagavan is Mano-harah for both categories of people. Sri Adi Sankara explains this as ‘Jitah krodhah yena sah Jitakrodhah; Vedamaryaadaa sthaapanaartham Suraareen hanti na tu kopavashaat – He is someone who has completely conquered the emotion of anger; Even when he kills the demons who are the enemies of the Devas, it is not out of anger but is in order to protect righteousness or Dharma’. The import is that Bhagavan unlike ordinary mortals is not aggressive out of anger but punishes evil-doers as a measure to establish Dharma. Even his killing is an act of mercy and not an act of anger. Sri Bhattar says Bhagavan gets angry only if and when He chooses to get angry of His own will; hence He is Jita-krodhah. 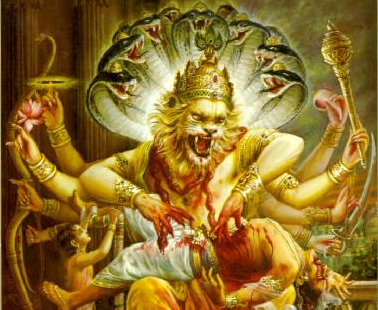 When His devotees are harassed or tormented, He gets angry and comes to their aid taking his ‘Ugra-form’ or angry disposition, as in Narasimha Avatar where he rushed in anger to protect Bhakt Prahalad. Sri V.V. 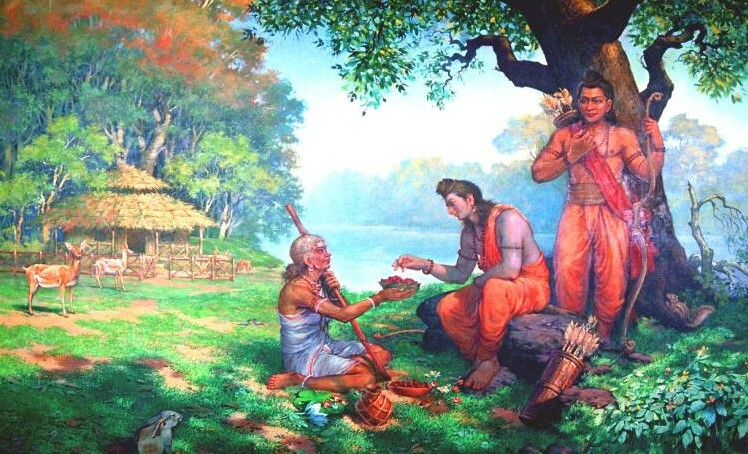 Ramanujan gives the following reference: In the beginning of Srimad Ramayana Sri Valmiki asks the question “Who is the Jita-krodhah” among people and Sage Narada responds that it is Rama – ‘Ucyamaano’pi parusham na uttaram pratipadyate – Even when others utter harsh words towards Him, He does not respond back with harsh words. Sri Radhakrishna Sastri distinguishes three types of anger, all of which have been mastered by Bhagavan. ‘Manyu’ is the type of anger which is in the mind but which does not find expression in words or action. When the anger spills out in the form of reddening of the eyes, expression in the face, etc., this it is called ‘Kobham’. When anger finds expression in harsh words, shaking of the body, deeds which reflect harshness as a result of the anger, etc., then this is called ‘Krodham’. It is to be noted that Bhagavan has not eliminated anger completely, but has conquered it, and will get angry when He feels the need for it. Sri Valmiki nicely expresses this through the words “Krodham Ahaarayat teevram” – 3.24.33 – He brought Himself to be angry and adopted a mask of extreme wrath to eliminate all the demons. Meaning: Thereupon, seeing Hanuman the Tiger among the monkeys getting wounded by Ravana, Rama was transported with anger. (Yuddha Kanda 6.59.136). Swami ChinmayAnanda extends the anubhavam to include not just Krodha, but all the six types of afflictions that a man can suffer from – Kama (lust), Krodha (anger), Lobha (greed), Moha (delusion), Mada (ego or arrogance) and Maatsarya (envy or jealousy). This Nama indicates that Bhagavan has conquered all of these. Sri Satyadevo Vasishtha, who in addition to his great mastery of Sanskrit was an expert in Ayurveda as well as in Astrology, comments that Krodham arises as a result of hormonal or chemical imbalance in the body. Since Bhagavan is not subject to these deficiencies, He is not subject to Kama, Krodha etc. Sri Adi Sankara takes this as a logical sequel to the previous Nama and interprets this as ‘Tridasha shatroon nighnan Vedamaryaadaan sthaapayan Vikramashaalee baahuh asya iti Veerabaahuh – His arms are powerful and mighty to be able to kill the enemies of Devas and establish deference to Vedas and Dharma’. Sri Parasara Bhattar’s interpretation of this Nama is that Bhagavan has a thousand arms which are all vying with each other in the wonderful act of churning the Milky Ocean; His arms shining with effulgent bracelets, armlets, and garlands. Meaning: Rolling the big serpent Vasuki over the big mountain Mandara, the Lord churned the Ocean with a thousand arms. In Thiruvai Mozhi (10.1.1) Pasuram, NammAzhwar composed – ‘Asurarai-tagarkkum tolum naangudai – The destroyer of Asuras with his four mighty arms. Sri Radhakrishna Sastri observes that a Veera is one who engages in his act with intensity in a prescribed way without backing down. Bhagavan’s four hands with four different weapons in them simultaneously go into action independently of each other, and accomplish the desired action flawlessly, each one of them displaying the quality of the Veera independently. The Dharma Chakram writer observes that a Veera is one who uses the might of his arms to help the cause of dharma and not for any selfish purpose. Ravana was also one with mighty arms, not just two but twenty of them. But he cannot be considered a Veera, since all he could use his might for was to nurture his Kama. This Nama of MahaVishnu should remind us that our abilities should be put to use to protect dharma, and not for selfish purposes. Sri Adi Sankara interprets this as ‘Adhaarmikaan Vidaarayati iti Vidaaranah – He cuts away or eliminates those acting against Dharma hence he is called Vidaaranah’. This is the reason why he incarnates himself time and again whenever Dharma and noble people are threatened by evil doers. He cut off Rahu with His Divya Ayudha during the distribution of nectar to the Devas. He is also known as Vidaaranah because He cuts off the greatest of fears in His devotees – “Samagra ugra bhaya Vidaaranaaya” is the mantra about Bhagavan. Sri V.V. Ramanujan refers to Thiruvai Mozhi 9.10.6 – Sem-ponaagattavunan udal keendaavan – He tore apart Hiranyakashipu’s body to help/rescue His devotee. The Dharma Chakram writer gives the interpretation that Bhagavan tears away the association (bandham) between the Atma or the soul and the body or prakriti. Bhagavan is the one who separates or tears away the unchanging soul from the ever-changing body. Sri Satyadevo Vasishtha points out this Guna of separating – Vidaarana, in all aspects of His creation. Thus man and woman, day and night, Uttarayana and Dakshinayana, prithivi and antariksha, agni and soma, etc., are all demonstrations or reminders of this Guna of MahaVishnu as Vidaaranah. He is the one who cuts the umbilical cord that separates the child from the mother at the time of birth so that the two live separately. Bhagavan makes good of his vows to protect anyone who surrenders unto Him, hence He is Suvratah. He has a beautiful, enchanting, mesmerising, handsome, charming and pleasing face with large blooming eyes resembling the lotus-petal, so He is Sumukhah. He is subtle and difficult to comprehend who can only be realised through constant contemplation and deep meditation, hence He is Sukshmah. He has a sweet and mellifluous voice symbolising the Vedas. 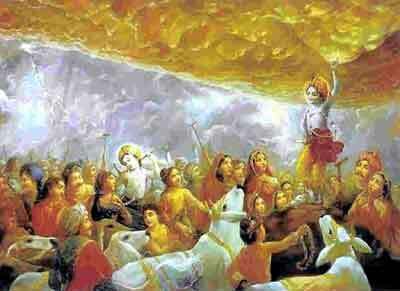 He also has a very powerful and mighty voice like that of a thunder, hence He is called Sughoshah. He confers happiness on righteous ones and deprives the evil and wicked of their joy, hence He is Sukhadah. He helps people without expecting anything in return and is a well-wisher; hence He is Su-hrit. Bhagavan captivates everyone’s mind and heart because of his unlimited Bliss and hence He is called Manoharah. Bhagavan gets angry only when He chooses of His own will and He is the one who has conquered anger, so He is Jitakrodhah. He has mighty arms that destroy the evil-doers, to protect Dharma, so He is called Veerabahuh. 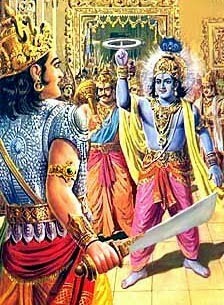 The Lord destroys those who act against Dharma and hence He is Vidaaranah. Excellent. I really like the detailed references to Divya Prabhandam and upanishads. Thank you 🙂 God bless you! Hari Om! The most beautiful highlight in this part is”Ezhai Ethalan keezhmagan ennaa thirangi matravar kinnarul suranthu” Most beautiful verse. One of the best of Thirumangai Azhwar Pasuram. Pull arikardhu! No words. Thank you Aishwarya 🙂 Indeed, Rama’s humility, poise, affection and care comes to the fore in these lines! Hari Om Sir! I have shared this divine link on our Whatsapp group. My friends are very impressed too. There are no words to describe sir, its so meaningful, every single nama is explained with much detail. Hari Om! Thank you Lakshmi ji 🙂 It’s nice of you to share. God bless you! Hari Om! Pranam Guruji! I am overwhelmed so much by reading this sir. Everything our Appaji taught us we are reliving him through your description. We loved the story of Guhan. In the story of Guhan we can feel the love of Guhan which is so deep similar to Sudhama. Thank you very much sir. Its like drinking nectar of the great Lord. Thank you Lakshmi ji 🙂 Great to know that! I would say Guhan was one step higher than Sudhama in his pure Bhakti because he never expected any material benefits from Lord Rama whereas Sudhama was motivated by his wife to meet Krishna to seek material rewards! Thank you. Good luck to your efforts. Hari Om! God bless you Sowjanya! Hari Om! Greetings sir! Divine sir. Thank you! God bless you Taneesha! Hari Om! Hari OM UNCLE! Very beautiful commentary. I loved it all. The story is very nice. So sad Guhan does not realise that LORD RAMA is a Brahmin, but Rama is such a nice person that he takes it. I am sharing a shloka on the beauty of God. 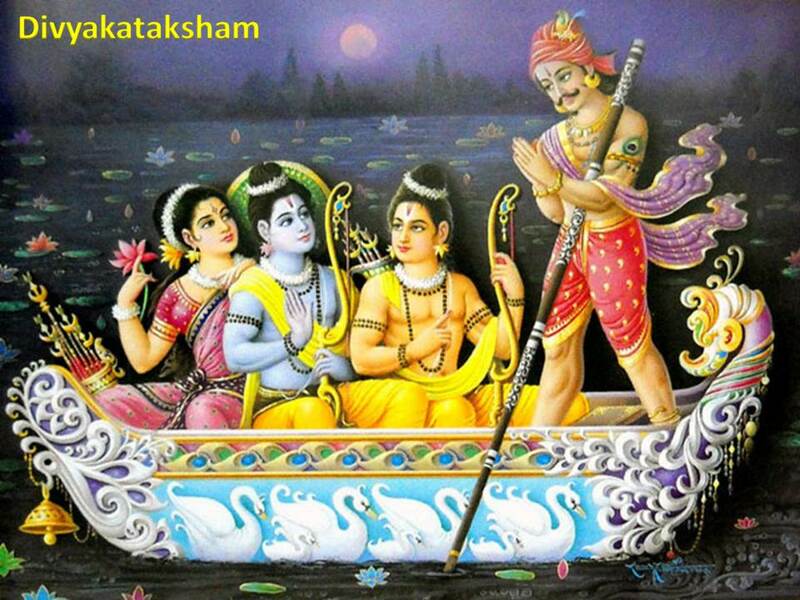 Madhurashtakam has 8 verses that extoll the beauty of Lord Krishna. It is very rhythmic, melodious and visually rich in its description of Govinda. The composer of this astakam is Sri Vallabhacharya (~15th Century AD). It’s a beautiful composition and if you hear MS Amma’s rendition, you can be transported to another world! Thank you for sharing the same 🙂 God bless you! !